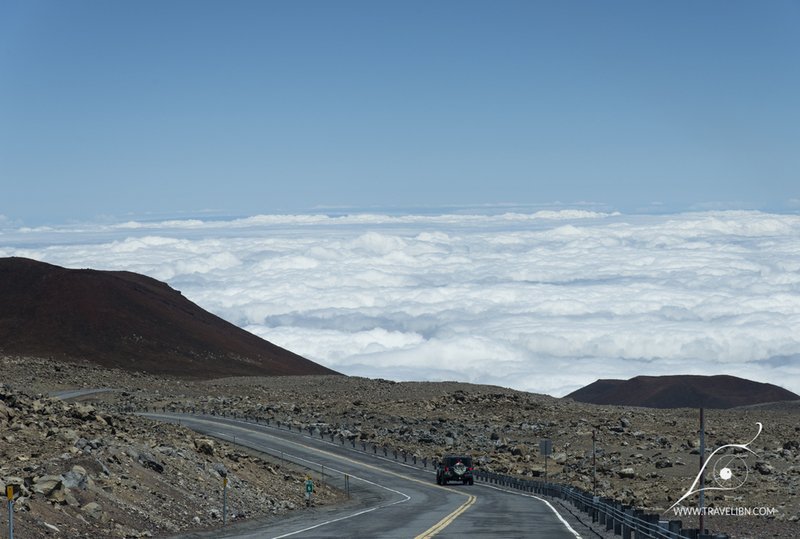 Mauna Kea is an amazing mountain- there is so much to see and do it’s almost impossible to experience everything it has to offer in a single day. Beside its cultural significance, its many hiking trails and the roadside vistas that stay in one’s memory forever, this dormant shield volcano on the island of Hawai’i is also home to 13 of the world most powerful and technologically advanced astronomical observatories. 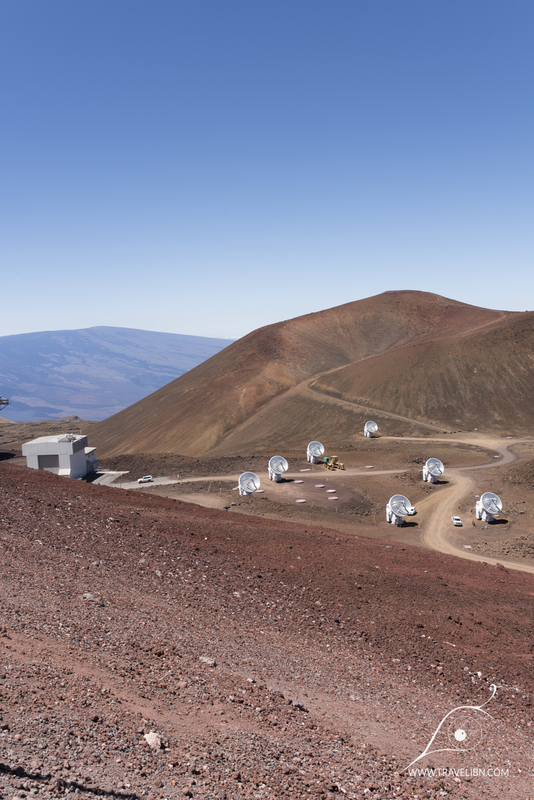 Scattered throughout the summit area of Mauna Kea, most of these research facilities are closed to the public, except one that offers regular educational tours- the Subaru Telescope, operated by the National Astronomical Observatory of Japan. Guided tours to Subaru Telescope, offered twice a week (usually on Tuesdays and Thursdays), are free to attend and are conducted in Japanese or English. You need to register a week in advance to participate in the tour and to do so, please visit Subaru Telescope official page. Subaru Telescope is an optical/infrared telescope with an 8.2 meter primary mirror, funded and operated by the National Astronomical Observatory of Japan. It’s named after a star cluster known in English as M45, the Pleiades or the Seven Sisters (yep, it has nothing to do with a car manufacturer of the same name, but at least it explains the company’s logo:) and in Hawaiian as Makali’i. The construction of Subaru telescope begun in 1991 and it took seven years to complete. First astronomical light was registered in 1999. The primary mirror of Subaru Telescope is a state-of the art piece of optics- as I mentioned, it is a 8.2 meters (26.9 feet) in diameter, 20 cm thick (7.9 inch), single piece of ultra low thermal expansion glass and weights a hefty 22.8 metric tons. It’s development took seven years to complete- 3 years for casing (which was done in facility in New York state) and another 4 for polishing and finalizing ( in Pennsylvania)before it was shipped to Hawai’i. The process of polishing the mirror is so precise, the average imperfection (bump) in the mirror’s surface is only 0.012 µm (for reference, average human hair thickness is between 17 to 181 µm), making Subaru Telescope produce ultra sharp images of the night sky. The primary mirror surface is coated with an extremely thin layer of aluminum, while the two secondary mirrors, the visible wavelengths and infrared, are coated with aluminum and silver, respectively. 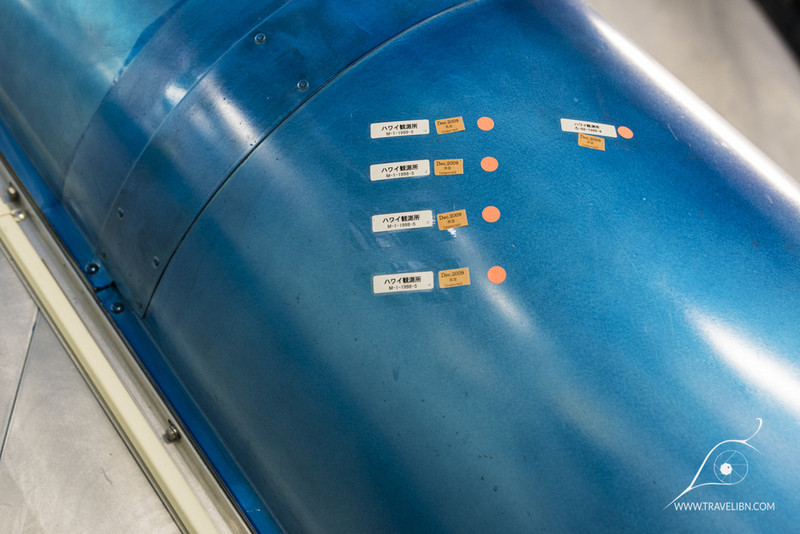 Subaru Telescope has an in-house coating facility you can visit while attending the tour (scroll down for images). Another interesting characteristic of Subaru Telescope primary mirror is the 261 robotic actuators that are installed into sockets that were precisely drilled in the mirror's underside. The purpose of these actuators are to maintain a perfect shape of the telescope’s primary mirror. Subaru telescope is a Ritchey-Cherries type of Cassegrain Telescope, which means it has a hyperbolic primary and hyperbolic secondary mirror . The main advantage of this type of telescope is its wide field of view, which enables Subaru to take images of large numbers of very faint astronomical objects. 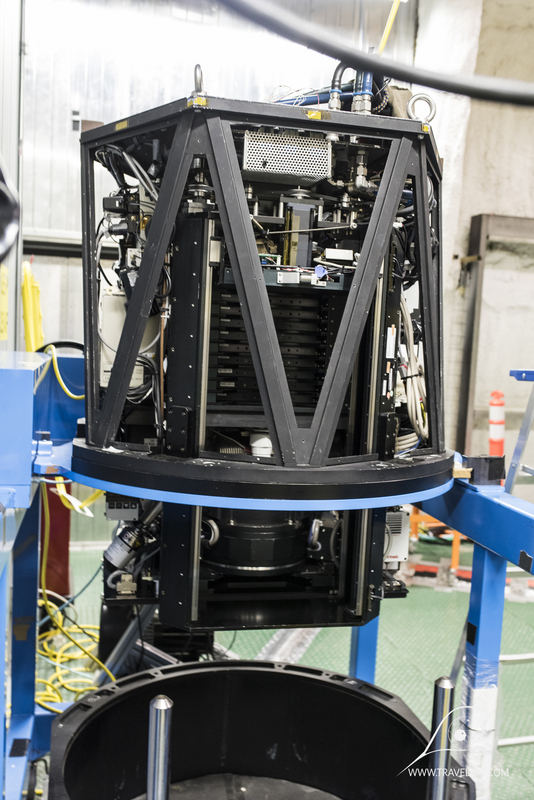 Subaru telescope has a large number of interchangeable instruments that are mounted at prime focus, above the secondary mirror, using a robotic arm known as The Top Unit Exchanger. 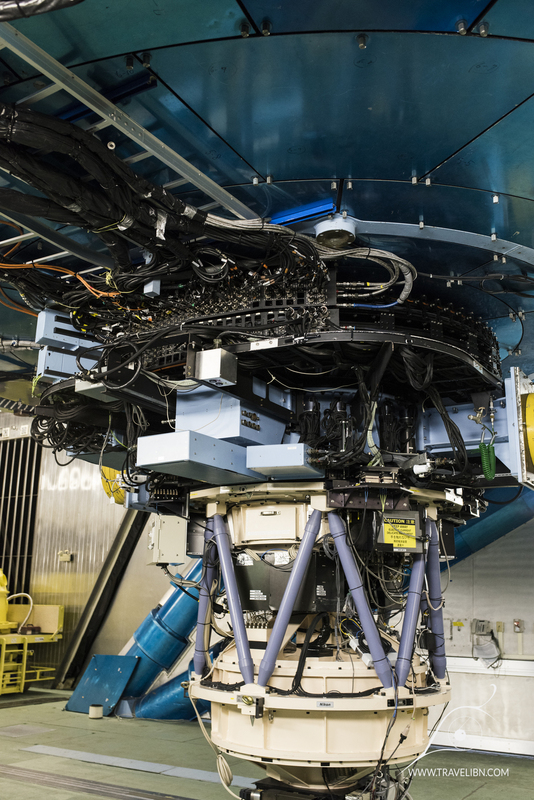 The facility currently uses nine instruments for observation in the visible and infrared spectrum of light, of which the most recent is called a Hyper Suprime-Cam (I love how researchers call this things, really...). This new ultra wide field camera has a 900 megapixel resolution and since 2014 its use helps scientists determine dark matter distribution in distant galaxies. Two interesting facts I’ve read about Subaru Telescope- first, it currentlyis the main tool for search of Planet Nine, a hypothetical large planet thatmay hide behind the orbit of Neptune and Kuiper belt of our Solar System, waiting to be detected. Its existence has been mathematically calculated and if found, it is predicted to be 10 times the mass of Earth. Secondly, Subaru Telescope is one of the very few large telescopes that can be fitted with an eyepiece and see through with a named eye. Obviously, this kind of observation is never a preferred way of doing astronomical research, however an eyepiece was constructed especially for when Princess Sayako of the Japanese monarchy visited Mauna Kea. the distant cinder cones and a blanket of clouds that "hugs" the mountain for large portion of the day. 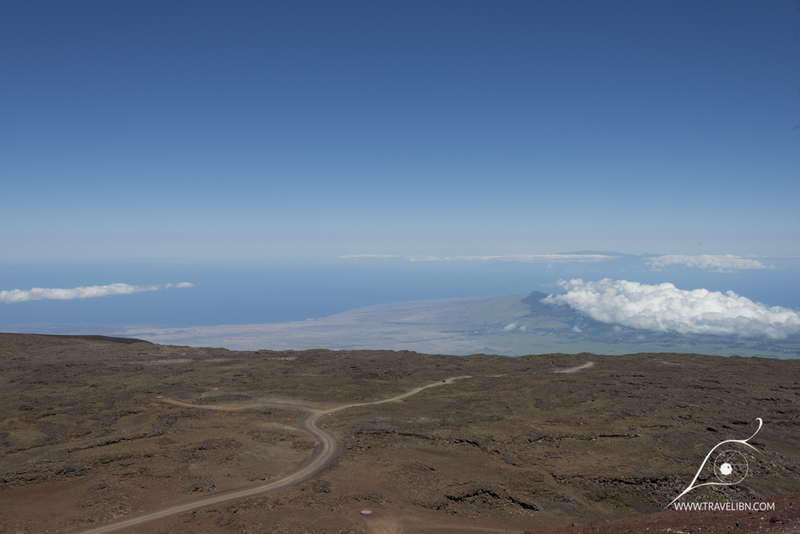 Most of all, the top of Mauna Kea offers an undisturbed view of Hawai'i other iconic landscape, the active volcano of Mauna Loa. It is an enormous, gently sloped mountain zig-zaged with recent lava flows. Upon arriving to the telescope's main door, we were greeted with our tour guide, Ms Kumiko, who handled out hard hats and took us to the elevator to see the main enclosure of the telescope itself. First impression- they are prepared for the worst. There's even a bathroom inside the elevator in case you get stuck. The main room is the telescope's bottom, where Cassegrain Instrument is located. The instruments can be interchanged using an automated machine called the Cassegrain Instrument Auto eXchanger. It moves on rails built into the floor and can be jacked up or down to reach/store instruments. The crew that supervises instrument changing is working during day shift, preparing the telescope for nighttime observations. The Cassegrain Instrument and it's assembly all are perfectly balanced to have the center of gravity exactly at the center of the instrument. Seeing this whole thing, with all its technological grace, is a jaw dropping experience. It's humanity at it's best, working together to design and built such a powerful tool for scanning the skies. Everything about the telescope built and mechanics (explained by the tour guide) makes one appreciate the collective "brain" that was needed for it to exist ( I also felt a little dumber not knowing what any of the elements are meant to do:)). Kumiko showed us other Cassegrain Instruments being stored in the adjacent rooms (by the way, all interior of the telescope is conditioned to match the outside temperature), and then took us to the front of the room, closer to where the telescope curtain is located. From here, you can see the entire telescope structure in all its beauty. Looking from the bottom up is the Cassegrain Instrument, followed by a Primary Mirror enclosure, then Nasymuth Focus (one for optical and one for Infrared), and on the very top, the Primary Mirror and the telescope's most important area- Prime Focus. Again, the Observational Instruments, such as the earlier mentioned Hyper Supreme CAM, are exchanged using a robotic arm, this one called simply The Top Unit Exchanger. Subaru telescope also has a laser guided system also mounted on the telescope frame. Next, Kumiko took us to the upper floor, from where you can see the Primary Mirror enclosure (the mirror itself is not visible, because it sits in a protective case when it is not being used for observations) and the Top Unit Exchanger from up close. Actually, a team of mechanics were working on changing the Prime Focus instrument while we were touring. Next stop of our tour was a room where all the multimillion dollar Prime Focus instruments are stored when not in use. I stay stunned, not even knowing what I am looking for exactly. Kumiko allowed us even to take a peek on the underside of one of the instruments to see the mirror. After seeing the "brain" of Subaru Telescope, we've been taken to see it's "heart and muscles". The machine room main feature are the huge rollers that enable maneuvering of the telescope body. Again, we were stunned by the complexity and thoughtfulness of mechanics that make this thing work. From there, we visited even more technologically "infested" room- the primary mirror recoating facility. This is where Subaru primary and prime focus mirror is recoated. After some time, a telescope's mirror starts losing its reflectiveness and have to be recoated. The process of recoating mirror's surface is long and extremely precise. First, the team working at Subaru dismount the mirror using a robotic exchanger, then they take it down to the recoating room to clean it. There is a pressure washer built especially for the mirror's diameter that strips the existing coating and prepares the mirror to be recoated. A huge chamber, called the large-size vacuum evaporation chamber, is what is used to put a new film on the mirror's surface. Washing station for the primary mirror. This thing is huge and reading previously about the steps that have to be taken in order to recoat a telescope, it felt really impressive. We reached the end of our tour, took some group pics and head back exploring the amazing Mauna Kea summit area.